Foosball is one of the more exciting table sports or activities that you will come across. For those of you who are unacquainted with foosball, we will be taking a look at the game and its rules before we dive into the heart of our subject. While this may seem unnecessary, it always helps to make sure that all of our readers are on the same page. Foosball is a game in which several rows of miniature players (usually four rows per side) play a game of soccer against each other. The players are attached to the table by rods that run through the sideboards of the table, which are there to ensure that the ball does not escape the playing area. There is a round ball which is placed in the playing area, and it must be hit by rotating the handles to turn the players. The objective of the game is to score a set number of goals against your opponent, but scoring systems can vary between different styles of foosball. Most games will end after five or seven goals, however. You will find that foosball is highly versatile and very enjoyable, but there are a few issues when it comes to playing foosball. One of the biggest problems is that foosball tables are often hard to come by in venues that are not arcades, bowling alleys, or bars. If you are a foosball enthusiast, you may have to invest in a table. Unfortunately, foosball tables are rather complex products, which means that they will be more expensive than most other types of games that you can purchase for play at home. If you choose to invest in a cheap foosball table, you may find that you have a whole new set of issues to contend with. As with many other cheap versions of products that were initially expensive, you will find that affordable foosball tables can go one of two ways. You can either find a full-size model which features terrible build quality and may end up breaking after two days of use, or you can find a small model which features reasonable quality. The unfortunate part is that even the smaller tables will end up costing you a pretty penny, which means that you may not be getting your money's worth out of them. 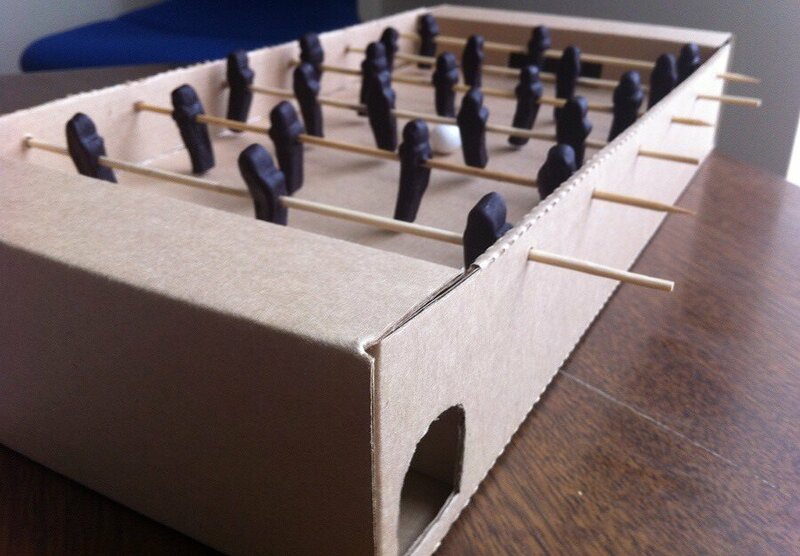 Thankfully, you have another option at your disposal: the DIY foosball table. Before you start laughing, consider that it is a genuine alternative, and bear with us. 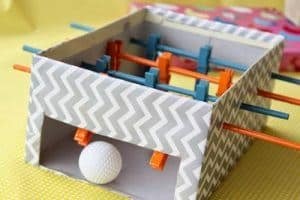 The first option you have is to assemble your own foosball table out of individual parts, which will make for a slightly less pricey alternative to a full-size model which has been assembled in a factory. If you are handy enough to ensure that your foosball table is built to proper specs, you will find few issues with this route. Most, if not all, foosball table parts can be purchased directly from the manufacturer for use as spares. While their primary reason for sale is for use as spares, you will find that these parts will allow you to assemble your own foosball table. While this is not true DIY, it provides a suitable middle ground. Where full-size foosball tables of high quality will usually cost you around 500 to 700 dollars, a model which you assemble yourself can be found for as little as 300 dollars. Of course, 300 dollars only accounts for the price that you will be paying for the parts and will not account for the time you put into making the table, also known as the opportunity cost. While the opportunity cost will be more substantial than the short amount of time that you put into assembling a factory-made model, you may find that you have more substantial savings. If money is the main obstacle to you acquiring a full-size and quality foosball table, you will have to take this route. The next choice you have is a cardboard foosball table. You can make this type of table out of any kind of product which is made out of cardboard, but the option which is used most often is a cardboard box. A cardboard box makes for a rather resilient table that already has the basic shape which is needed. 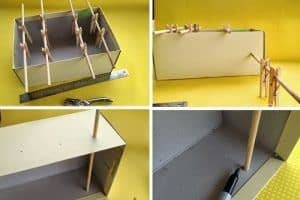 You will want to start by trimming down the sides of your cardboard box and poking holes in the sides through which you can insert your handles, which can be made of sticks or kebabs. The next step is to add the markings on your playing field, which will delineate the center and the goalie creases. Once this is done, cut holes for your goals, and add a hole in the side for ball insertion. You can cut your players out of cardboard and reinforce them using multiple layers glued together. The ball can be made out of putty or any suitable substance which can be molded into a shape you need. To make this foosball table, you will only need to follow a few steps. 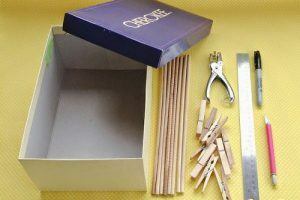 First, poke holes in the side of the box and insert four kebabs or wooden dowels. Once this is done, use clothesline pins as your players by attaching them to your kebabs. 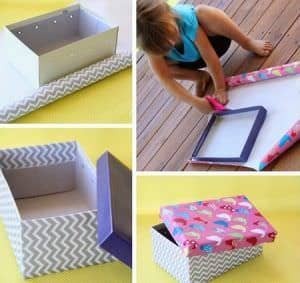 Cut out goals in your shoebox and add lines, if you would like. When you are done, you will be able to play your game of foosball. Use a ping pong ball for the ball. As you can see, making your own foosball table is easier than it may appear to be at first. We hope that this article has helped you in your quest for affordable foosball and we thank you for sticking with us through the instructions.